When Dr. King gave his famed “I Have a Dream” speech in 1963 at the March on Washington, there was optimism that the dream could be achieved. Yet what he said then remains true today. What exists is still a shameful condition. “It is obvious today that America has defaulted on this promissory note in so far as her citizens of color are concerned,” he said. More than half a century later, the note remains in default. This is no time to engage in the luxury of cooling off or to take the tranquilizing drug of gradualism. Now is the time to make real the promises of democracy; now is the time to rise from the dark and desolate valley of segregation to the sunlit path of racial justice; now is the time to lift our nation from the quicksands of racial injustice to the solid rock of brotherhood. Yes, sadly we remain far from achieving Dr. King’s vision. But we should use today to renew our commitment to his dream, for he never despaired of reaching the goal. I am immensely proud of all the School of Nursing has done and continues doing in pursuit of Martin Luther King’s dream. 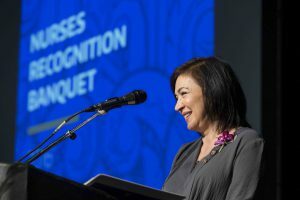 In January, the School of Nursing’s Dr. Wendy Barrington was honored with the Martin Luther King 2019 Community Service Award for her community work to improve healthcare access for marginalized groups. She, like Dr. King, understands that to achieve the dream changes are needed at the system level. It is up to each of us and all of us to make the dream come true. Please take the time today to think about what you can at a personal, School of Nursing, community, country, and global level to fulfill the dream so boldly and eloquently articulated by Martin Luther King.